Reasons to choose Mediana? The unit is supplied with a protective outer cover. When the unit is opened using the easy-slide switch, the machine switches itself on automatically. The defibrillator pads are already connected and ready for use. 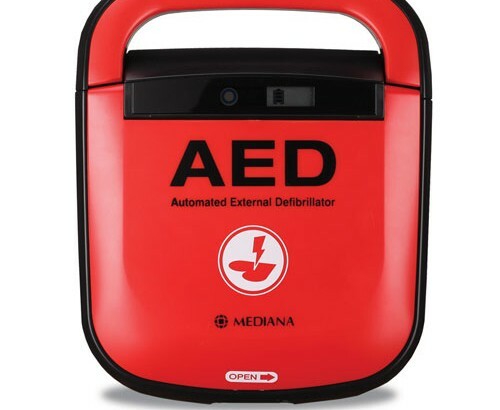 A combination of LED indicator lights and clearly spoken audible voice prompts, make the AED safe to use even by untrained persons. Visual icons are clearly defined to assist the user, and the clever addition of a switch to flip the machine from Adult to Paediatric mode (or vice-versa), means the pads are suitable for both situations. The battery is a disposable LiMnO2 Non-Rechargeable version with two years shelf life, and an amazing five years standby life. Automatic switch-on when lid opens. Pads fit both Adults and Paediatrics. Suitable for schools, teams and clubs. Switch from Adult to Paediatric.